شربت Sharbat is a popular sweet drink made from fruits or vegetables and is served over ice. 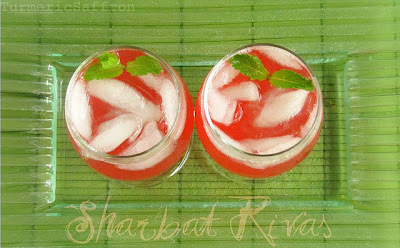 شربت ریواس Sharbat-e rivas (rhubarb sherbet) may not be as widely known or as popular as sharbat-e limoo however it's equally refreshing and visually beautiful with its stunning pink color! Rhubarb's season is very short and each year I only spot them a few times in the farm market. I always buy rhubarb stalks as soon as I see them, knowing I may not find them anywhere for another year. Now, I see bundles of them where I live. Last year, I wrote about the delicious rhubarb savory dish Khoresh Rivas (Persian Rhubarb Stew). Rhubarb sherbet has a well-balanced sweet and tangy taste. However, it all depends on each person's tastes and palate. Personally, I like a sherbet slightly more on the tangy side than sweet. Sherbets were a common summer drink in our home and my mother always knew how to make the best sherbet without a written recipe. In fact, all her cooking was done that way. Until one hot summer afternoon when my father called to say he was on his way home and was bringing along with him a prominent elderly family friend and a couple of his acquaintances. Bringing guests to our home without any prior invitation was not an unusual practice. From early hours of the morning until the late hours of the nights, friends, neighbors and family members would drop by and pay a visit and my parents were very comfortable and relaxed with that arrangement. On that day, my mother headed into the kitchen, filled up the kettle with water to brew some loose leaf tea, refilled the ghandan (sugar-cube container), washed some peaches, plums and cherries and then decided to first serve some ice cold sharbat-e limoo due to the hot weather. 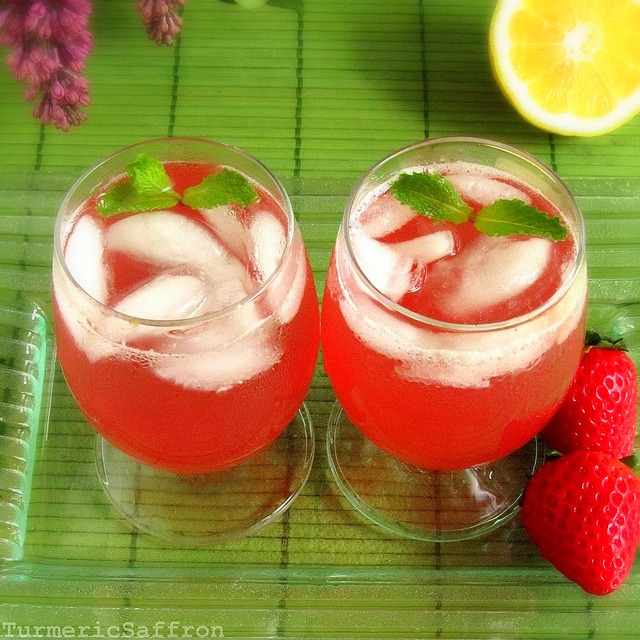 She poured some fresh lemon juice into a large glass pitcher, added some water and sugar as she would normally do and stirred them together hurriedly. She tasted the drink but it didn't taste right, she poured in more lemon juice, one or two cups, perhaps. 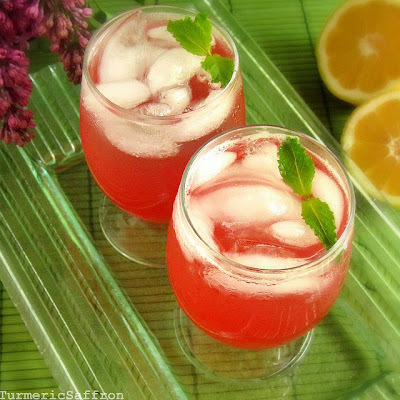 She quickly tasted the sharbat and felt it needed to be more sweet, she added a couple scoops of sugar, stirred and tasted, it wasn't the right consistency. She diluted it with more water. Now it was too watery and she squirted some fresh lemon juice. In that moment of panic my mother couldn't quite remember the right amount of each ingredient needed for this recipe and kept on adding and mixing lemon juice, sugar and water until she was interrupted by the sound of the doorbell. This became the story she would tell us for years to come, how on that day she lost her touch for whatever reason and ended up with several gallons of sharbat that just tasted funny! Place the rhubarb chunks into a large pot and pour in 3-4 cups of water to cover the rhubarbs. Bring to a boil on medium heat, stirring occasionally and cook till rhubarb is completely soft about 5-7 minutes. Remove from heat and drain the rhubarb in a fine mesh sieve, pressing down on the pulps. Pour the juice back in the pot, add sugar and bring to a gentle boil over medium-low heat until sugar is completely dissolved. Reduce heat and simmer until the rhubarb syrup thickens a bit. Add a tablespoon of rose water for the added aroma in the last ten minutes. Remove from heat and allow to cool before pouring the syrup into glass bottles and refrigerate. 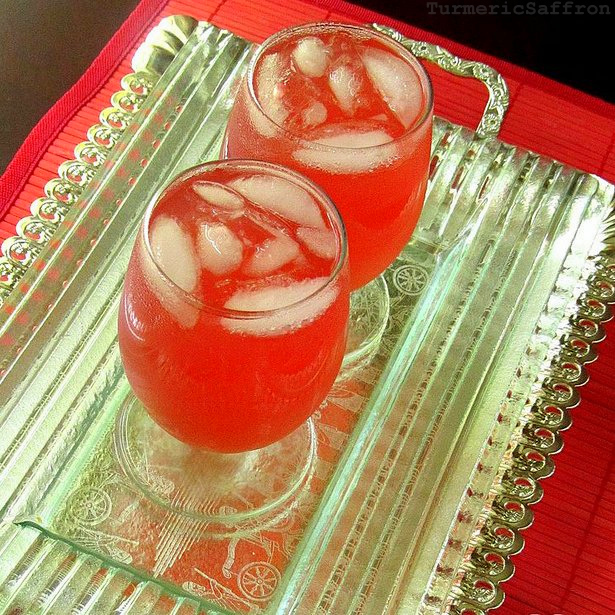 Combine a cup of rhubarb syrup with a cup of ice, 3 cups of water and lemon juice, mix well, taste and adjust to your liking. Serve chilled. A few weeks ago I came across an interesting online copy of an old and rare Iranian cookbook, dating back to the last years of the Qajar dynasty, written in beautiful Persian Nastea'liq handwriting. 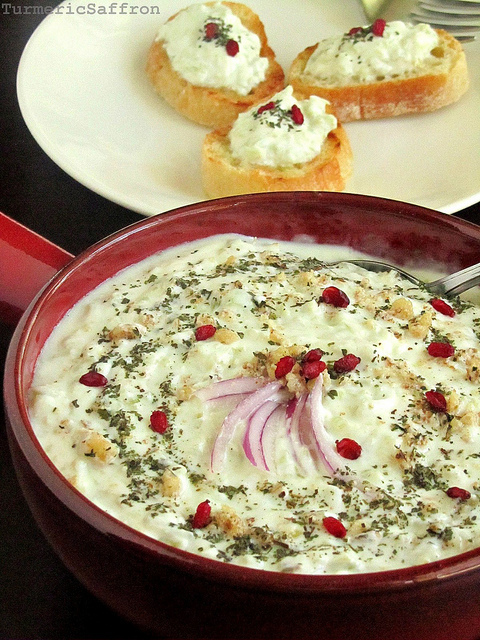 This cookbook may give us a tiny glimpse into the dynasty that ruled Iran from 1794-1925. Most of the recipes are brief and not easy to follow and some of them seem to be merely a translation of European recipes into Persian. The majority of the recipes basically include the list of the main ingredients with little directions. 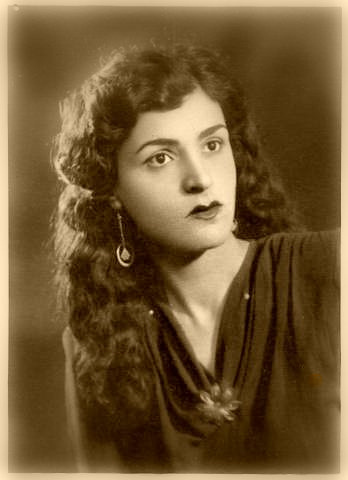 For those who are interested to see this document please click the following link Women's Worlds in Qajar Iran. While browsing the book, the recipe for بورانی کنگر borani kangar, also known as mast-o-kangar (yogurt with cardoons), caught my attention. That's when I decided to give it a try but the problem is that I have never seen Iranian kangar anywhere. Kangar looks like a thin celery with thorns and has a very delicate taste and they are in season for a very short time, a few weeks at most. Yogurt and cardoon dip has a distinct flavor and even though it may take some time and effort to prepare cardoons it is definitely worth it. Luckily, a few days later I was able to find cardoons that are a good substitute for kangar in John's Farm, an Italian vegetable market. However, fresh cardoon has a bitter taste and needs to be soaked or cooked in salted water. Also, in order to prevent cardoons from changing colors during preparation they need to be placed in acidulated water. I found the following link helpful in Preparing Cardoons. To prepare cardoons remove all leaves and thorns, peel strings with a peeler, cut the stalks into small pieces. To prevent discoloration place the cardoons in a bowl of water and juice of two large lemons for ten minutes. In a large pot bring 4 cups of water to a boil on medium heat, add 2 tablespoons of salt and cardoons. Cook for 10 minutes or until tender and drain. 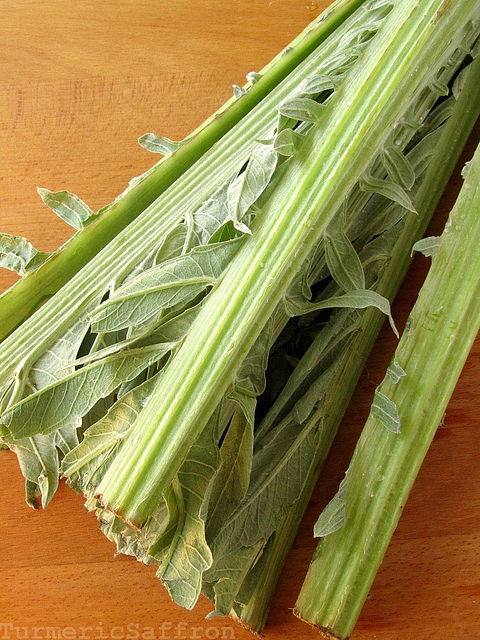 Chop cardoons finely by hand or use a food processor. Heat 2 tablespoons olive oil in a pan, add minced garlic and saute for 2 minutes. Then add the chopped cardoons and saute lightly for 5-7 minutes. Add a pinch of salt and pepper. Let cool. 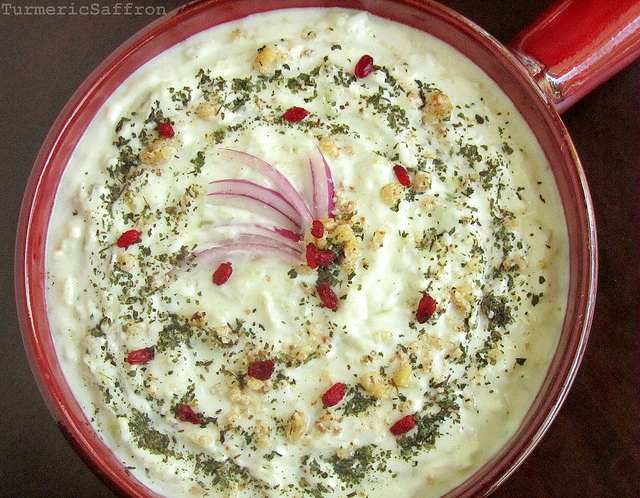 Combine yogurt and cardoon garlic mixture together, taste and adjust the seasoning. 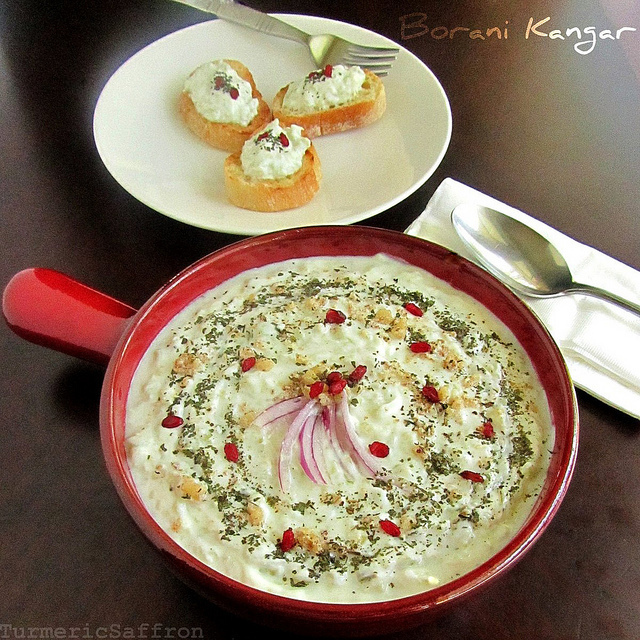 Place borani in a serving bowl and garnish with dried mint. I also used crushed walnuts and barberries but that's optional. 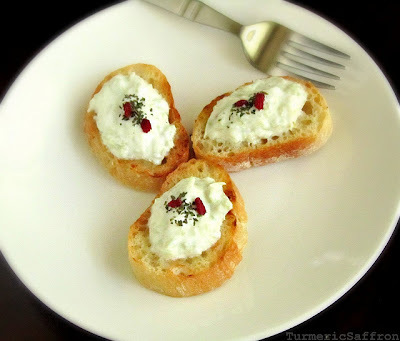 Serve it as an appetizer cold or at room temperature with your favorite dish or any party meals. *Variation: Combine chopped cardoons with yogurt, mix well and add salt and pepper to taste and skip step #5 in the above recipe.